"The Designer's Desktop Manual" unravels the essential technical aspects of key areas of print and screen-based design, type and typography, colour, imaging, layout, and printing, via step-by-step projects and inspirational examples. Each section will analyse the technological issues - from the most basic, introductory techniques and principles, to more advanced practices - and the skills needed to work within each area of design. "The Designer's Desktop Manual" empowers the amateur or student designer, tackling common technical problems and establishing best-practice guidelines alongside a wealth of technical hints and tips. 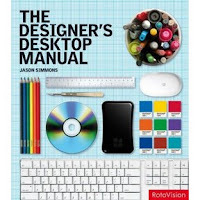 "The Designer's Desktop Manual" also puts the most up-to-date digital and hand-made techniques into the context of the evolution of design, allowing the design student to gain a deeper knowledge of design processes and techniques. Buy it, and buy it now! But why haven't you put an affiliate link in that Amazon link? Think of the river of sixty pences that would deluge you! Hi Chris. I thought about doing the Amazon affiliate thing, but the enormous affect it would doubtless have on my income would play havoc with my carefully-managed tax arrangements.